Firefox 4 is perhaps the most eagerly awaited version of Firefox till date. We have already given you the links from where you can download and install Firefox 4.0 Beta 1 for Linux, Windows and Mac. We took it for a spin in Ubuntu and here is our review of the first beta of Firefox 4.0. Obviously the first thing to notice when you Firefox 4 Beta is the "Chrome-like" tab on top. Or rather the lack of it in Linux. The new UI that Firefox 4 is to come with had me all excited and started it hoping to see it in action. It was a big downer though. Not only is the tabs where they have always been but the whole interface is the same as the previous version. Anyway, I am keeping my fingers crossed that we will see the new UI in the Linux version as well before the final release. There are some changes though. When a page is loading, there is a new indicator. And there is a feedback button so which, in my opinion, will get them more number feedback. Now let us get to the more important part, how does Firefox 4.0 Beta do when compared with the latest stable release, Firefox 3.6.6? While using it, it does feel a lot faster. We decided to do some benchmarking to find out exactly how much it has improved over the lastest stable release, Firefox 3.6.6. As you can see, Firefox 4.0 Beta is very much faster compared to the latest stable release. It is around 30% faster than Firefox 3.6.6. However, this is still not even nearly as fast as browsers like Opera and Google Chrome. 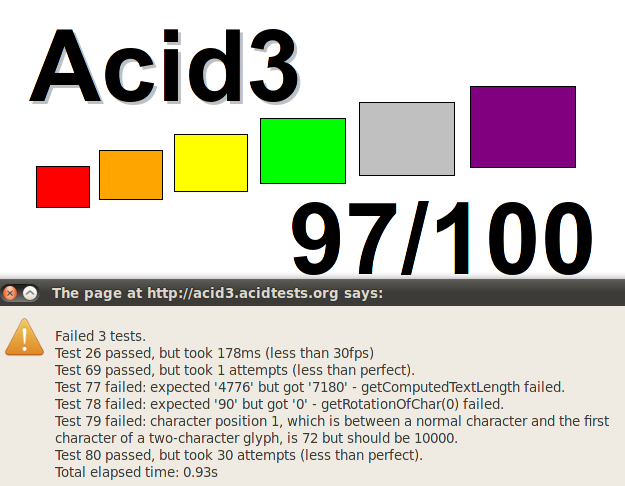 As compared to Firefox 3.6.6, which scored 94/100, Firefox 4.0 Beta scores 97/100 which is much higher. However, it still fails to pass the Acid3 test. 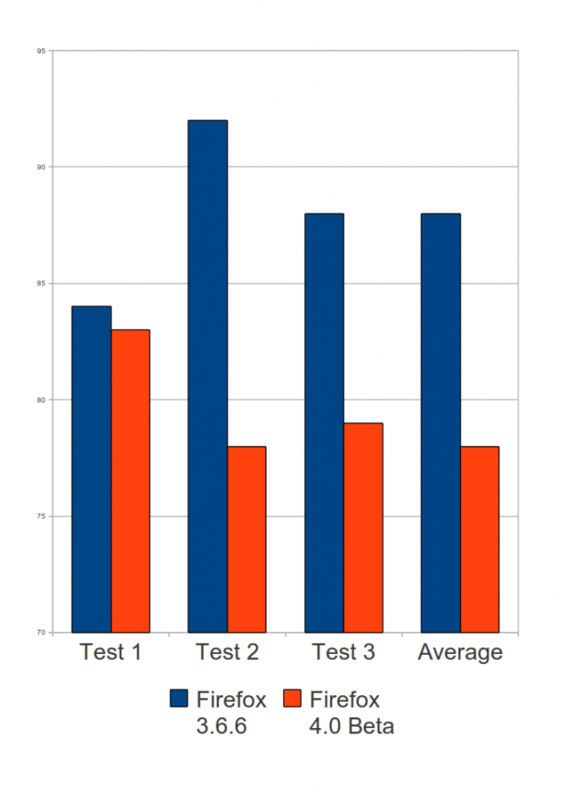 Firefox 4.0 Beta scores significantly higher than the previous version of Firefox. 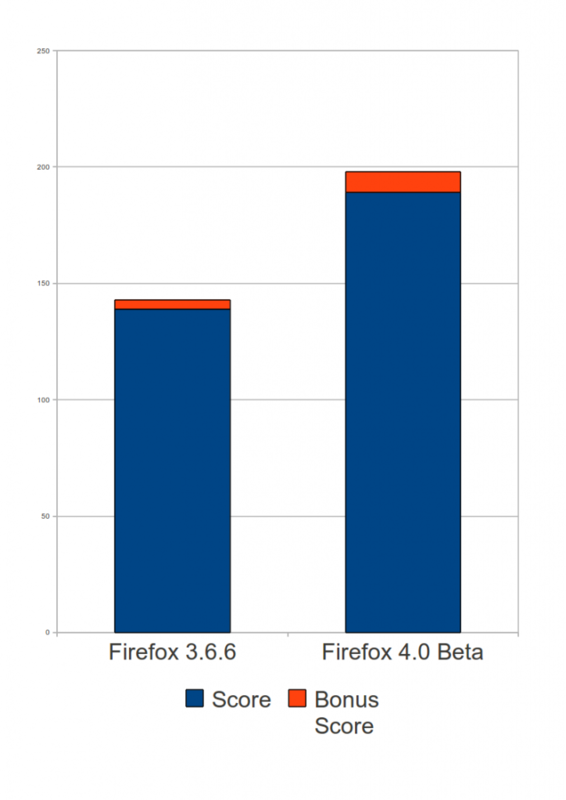 This means that HTML5 support in Firefox 4.0 is to be a lot better than in Firefox 3.6. 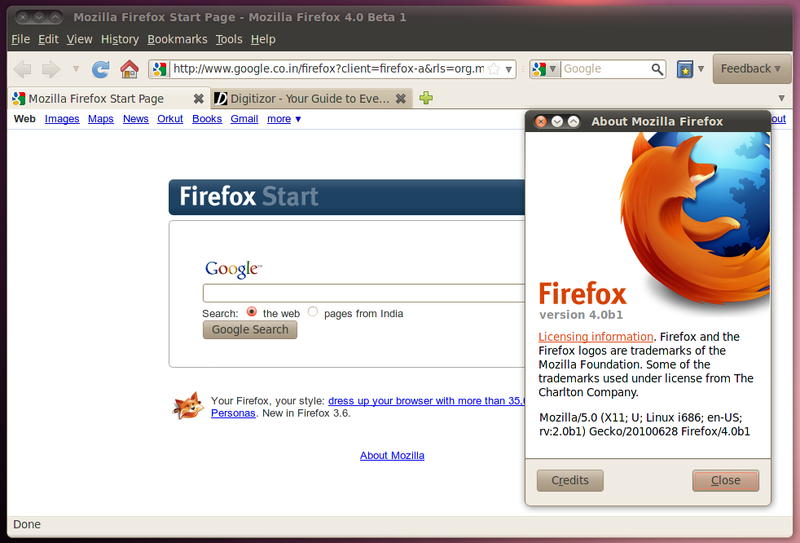 The score Firefox 4.0 Beta managed to get here is even comparable to that of Google Chrome. One of the main complaints about Firefox is its memory consumption. To find out if Firefox 4.0 Beta does better than Firefox 3.6.6 in terms of memory consumption, we tested both with 5 tabs open and then with 10 tabs. 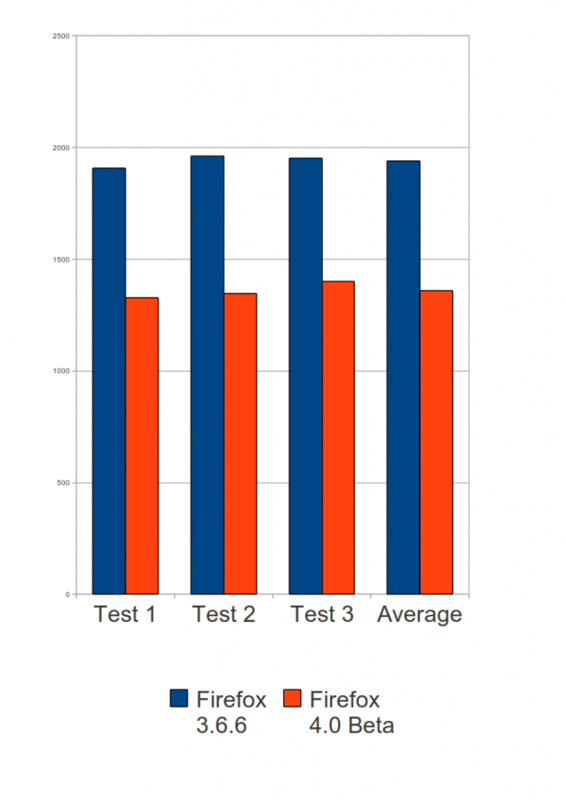 To rule out errors, we did the test 3 times. 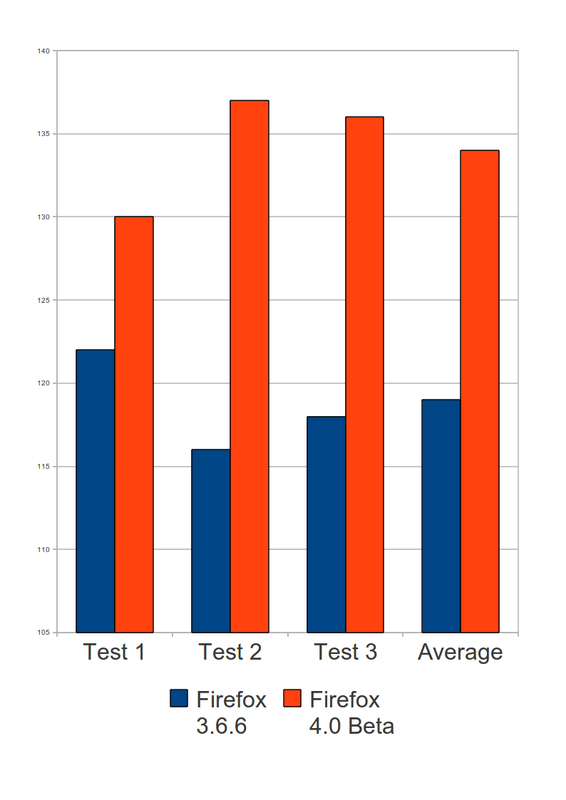 All the above tests shows that Firefox 4.0 Beta is indeed a lot better and faster than the previous versions. 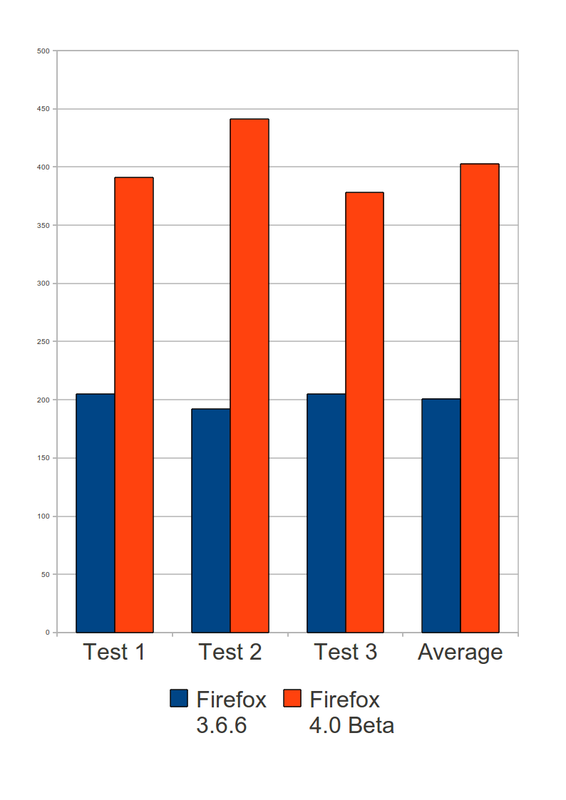 It completely outshines Firefox 3.6.6 in every test except the memory test with 10 tabs. As this is only a beta, we expect this to get fixed. The new tab on top interface is still not available in Linux yet, but we are keeping our finger crossed that it will be available before long.